Providing you the best range of brick wheel barrow with effective & timely delivery. 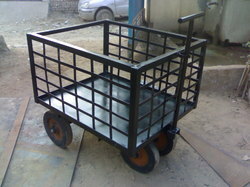 We offer clients precision designed and constructed range of Wheel Barrow for Bricks. Functioning as a hand-propelled vehicle, these are designed to ensure that the load pushing and guiding requirements can be met by a single person through use of handles available on the rear side. Our team of design engineers also ensures that the load is equally distributed between wheel and the operator, thus enabling convenient carriage of heavier & bulkier loads than would not have been possible otherwise.